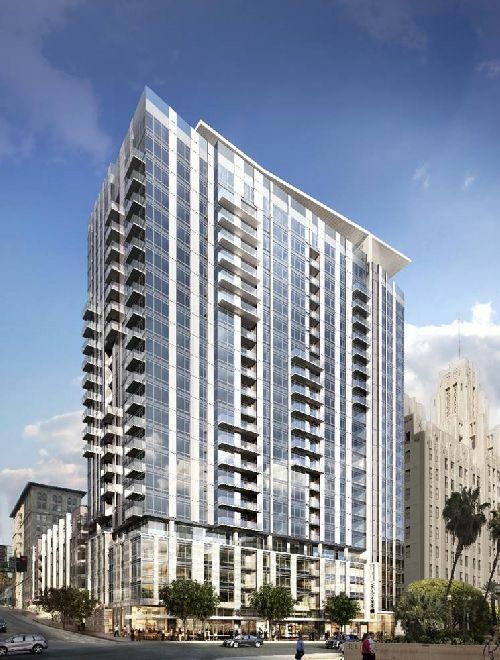 MacFarlane Partners has topped off Park Fifth, a 24-story high-rise that it is developing in Downtown Los Angeles. Situated at 427 W. 5th Street, Park Fifth will consist of 347 rental apartments and 5.3k sf of retail space. The project is being built adjacent to Trademark, a seven-story residential mid-rise building that MacFarlane also is developing. Trademark will house 313 rental apartments and 7.5k sf of ground-floor retail space. Suffolk Construction is performing construction management services for Park Fifth, while Bernards is performing construction management for Trademark. Both properties are scheduled to be completed during the first half of 2019. The Park Fifth structure tops off in Downtown Los Angeles during a time when the area is experiencing a significant construction boom, with developments that are more varied and expansive than in the past. Park Fifth is located across West 5th Street from the Pershing Square Metro Station, which provides commuters with underground-rail access to points throughout Los Angeles. The building is around the corner from the planned route of Downtown’s restored, historic streetcar line. Pershing Square, one of the largest public spaces in Downtown Los Angeles, lies directly south of the project, while Grand Central Market, a historic food hall and major local attraction, is on the next block to the north. Designed by Ankrom Moisan Architects, Park Fifth will feature a wide range of amenities, including a 360-degree-view rooftop deck with an infinity-edge pool and cabanas; a fitness center; and a clubhouse with a bar/kitchen, TVs, ample seating and a business center. The building also will have onsite resident concierge services; a controlled-access bike storage and repair area; and a dog walk and washing station. The project is targeting LEED-Silver certification upon the completion of construction.